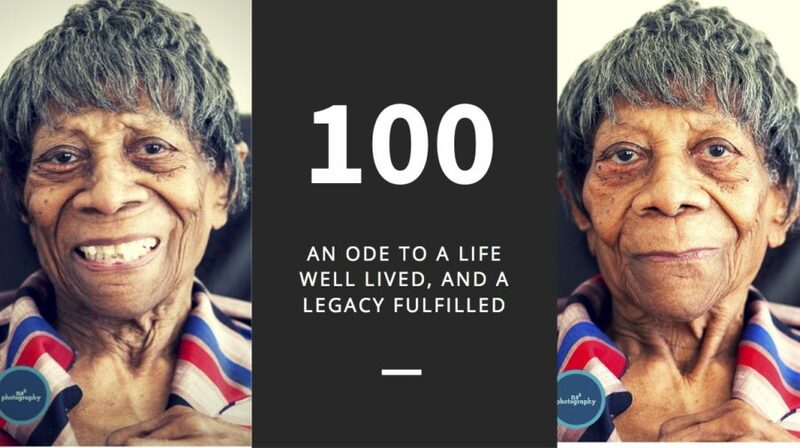 100 - An Ode to a Life Well Lived, Annie Ruth Atlas - who is nicka smith? She came, she saw, she conquered. And lived to almost 100 to tell about it all. “In some ways, I feel selfish because even though she was almost 100 years old, I just knew she’d be around forever. But this morning…I just keep saying “She’s gone” over and over again in my head. If she hadn’t lived, there would not be my mother and uncle, me, my sister, and first cousin, and our children. If she hadn’t lived and been into family, I wouldn’t be teaching others across the world how to trace their family history – her family, the Atlas family – is why I started it all. I literally saw her every year of my life even though for most of it, she lived more than 2,000 miles away from us. The time she fussed me how to make gravy from scratch, her love of New Orleans and how she passed it on to me, her disdain for the song “Old McDonald,” (especially the E-I-E-I-O part), the time she took me shopping in Chicago at Carson Pirie Scott or bought me Cross Colours for Christmas, or the time my play cousin got busted for dancing like James Brown in her wig. This Saturday, August 27, 2016 would have been my grandmother’s 100th birthday. We had spent years talking about what we’d be doing this week. A party. Good food. Lots of family and laughs. But as I sit her typing this, this week, I’m back to where I was on May 14. I still cant’ believe she’s gone. Children of Louis Balfour/Bareford Atlas, and Susie Lee Atlas – left to right – back: Wesley James Atlas, Lawrence Atlas, Rev. Francis Joseph Atlas, Louis Bareford Atlas, Jr., King D. Atlas. Front: Annie Ruth Atlas, Cora Mae Atlas Thompson, and Ethel Edna Atlas. Truth is, I’ve started and stopped this blog post five times in the last three months. Even now, I’m still not ready to write it, but the genealogist in me knows that I need to leave a footprint for her in this online world. As a researcher, we have so many scenarios that follow the phrase “Just in case…” I have to at least give her a “Just in case…” She’s got more than 1,500 genetic cousins alone. Some of them have reached out to me once they found out she died. Sometimes, it takes death to make folks reach out. Her and her siblings were an amazing lot. Out of the 11 of them, seven of them lived over age 90, four of them living past age 95, and one almost made it to 104. Annie Ruth Atlas was born August 27, 1916 in Lake Providence, East Carroll, Louisiana. She was the youngest of eleven children born to Susie Lee and Louis Balfour “Bareford” “Babe” Atlas, Sr. She was the granddaughter of Clora Evans and John Lee and Alice Smith and King Atlas, Jr.. She was the great granddaughter of Susan Russell and Moses Evans and Mary Dugan and King Atlas, Sr. The granddaughter of slaves, Annie was given the best education offered to African Americans in northeast Louisiana. She graduated from the East Carroll Parish Training School in 1933 and following graduation, she worked on the family farm located on Hood Lane Road. Her grandfather, King Jr., was known as a master agrarian who passed this skill down to his son, Louis. The family farm contained cotton, corn, melons, potatoes, turnips, and even a smokehouse along with animals such as cows, chickens, pigs, and more. 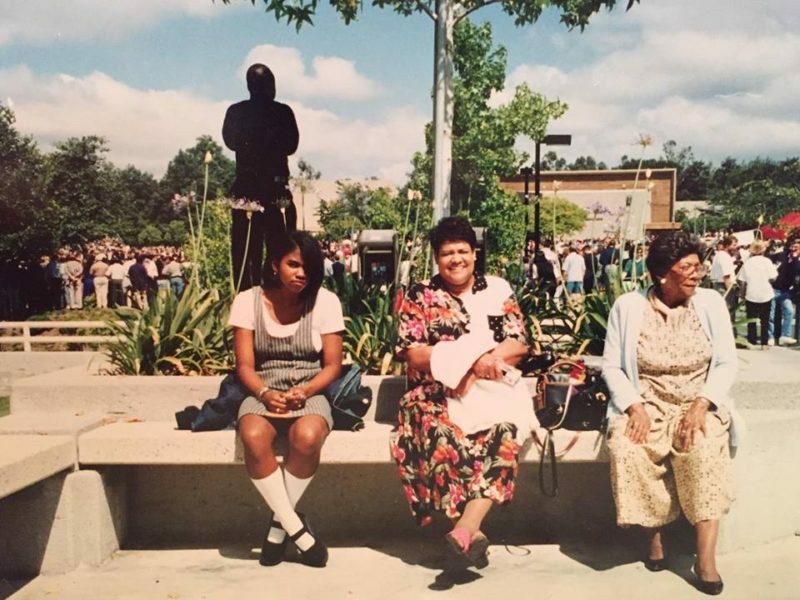 Me, my mother, and grandmother in 1995. Annie confessed a hope in Christ at an early age. She was first a member of Mt. Lebanon Missionary Baptist Church and later became a member of Progressive Chapel Missionary Baptist Church after its founding in October 1921. It was at this time that Annie had two children, a son, Cordell Baron, and a daughter, Barbara Jean. 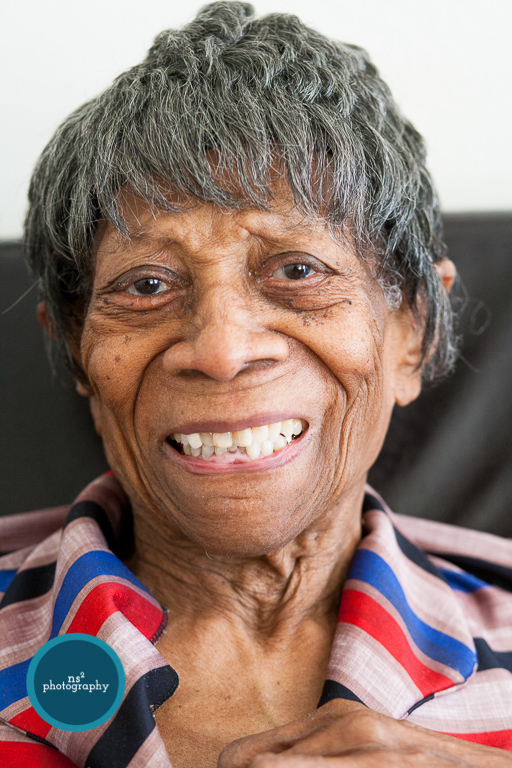 In May 1945, Annie took part in the Great Migration of African Americans out of the south and moved from Lake Providence to Chicago, IL, the residence of her oldest brother, King D. Atlas, and oldest sister, Ethel Edna Atlas. She joined a large group of family members who already lived in Chicago such as her aunt, Alma Atlas Singleton, uncle, Shurden Atlas, and first cousins, Joseph Clarence Gray, Beatrice Singleton, Ruby Singleton Carter (David), and James Burl Singleton. In Chicago, Annie was first employed as a domestic and then worked many years for Campbell Soup where she retired in 1974. 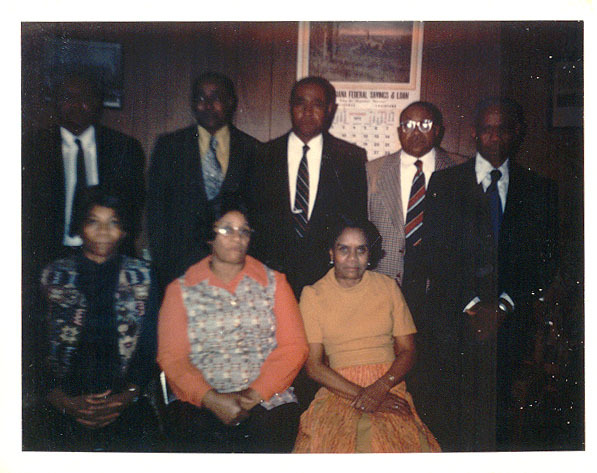 Annie joined St. Luke Missionary Baptist Church and served for many years in the Keep Shining Unit and Missionary Society. She also was very involved with the senior citizen group of the Salvation Army. Annie was well known for her cooking, in particular, her fried chicken and mouth-watering pound cake. It was requested so much that she would bake extras and place them in the deep freezer until they were needed by family and friends. Annie loved to shop and many admired her sense of style in clothing. She loved to have a good time and was often seen with a Miller High Life beer with a peppermint candy in it. She was especially fond of spending time in New Orleans with her older sister, Cora Mae Atlas Thompson, and spent many years celebrating Mardi Gras there. She was fiercely independent, never had a driver’s license, and lived on her own until moving to California with her daughter, Barbara, at the age of 90. Upon moving to California, Annie joined Amos Temple CME. She passed away on May 13, 2016 in Perris, CA. Annie was predeceased by her parents, Susie and Louis, siblings King D., John Atlas, Bertha Atlas, Susie Atlas, Louis Bareford Atlas, Jr., Rev. Francis Joseph Atlas, Sr., Lawrence Atlas, Ethel, Wesley James Atlas, and Cora. She was also predeceased by her grandchildren, Carl Bernard Atlas, Karen Chalice Atlas, and Donna Lynn Atlas. Annie leaves behind her children, Cordell (Carol) Atlas, and Barbara Sewell, grandchildren Steven Atlas, Nicole Robinson (Chris), Nicka Smith (RaShad), Jennifer Corrales, great grandchildren Dominic Atlas, Ashley Atlas, Michael Atlas, Maiya Robinson, Chandler Smith, Julia Corrales, Isabel Escalona, and Rylee Szente, nieces Susie Lee Ammons, Florence Marie Atlas, Marvaleen Atlas, Annie Elizabeth Chatman and Jean Denton Thompson (James); nephews Phillip King Atlas (Vearis Mae), Lawrence Atlas, Edward Delano Atlas, John Wesley Atlas (Arthurlean); and a host of relatives and friends.